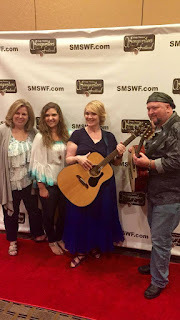 I want a cute way to tell you that my song "Feel This Way" won the Grand Prize in the Smoky Mountains Songwriters' Festival Competition on Saturday, like just putting up a picture of the certificate. But I don't have my Grand Prize certificate. Because, actually, someone stole it from the SMSWF when it was still blank. I know right? That's weird. There will be pictures of me holding my... well, not holding my Grand Prize certificate, but looking kind of rumpled and joyful; standing for pictures with the festival director and my singer. That's coming later. This festival, this contest, mean a lot to me because it's my community, and because this is where I started. I love the workshops and meeting people and sharing songs. Deciding which song is best is subjective and dicey and all that, but I am also deeply concerned and interested in what makes a song successful, what makes it well-crafted, and what reaches people. Not all the same thing, at all. I heard some other great songs. I had a finalist song in the folk category, and came in second. I didn't think my song, "Bad Bad Thing," was a winner, and the song that won was "China Plates" by Jess Chizuk and I am glad that song won. The winner in jazz / blues (which was really just blues) was Cari Ray, a smoky single-malt-voiced gal from Indiana who is cooler than you or I will ever be. Some guys I know nailed all the country songs, and I'm glad for them. Last year I heard a guy named Joe Hash in the slot before my gig at Tom & Earl's Back Alley Grill, and loved his songs and his voice. I urged him to enter the contest, and then kicked myself while waiting for results on Saturday, since his song "I Found Jesus" won the gospel category and the Listener's Choice award. I thought he might win the whole thing with it. I thought "Feel This Way" would be an audience favorite, but I also thought the judges would choose an "important," serious song over my breezy little pop song about young love. I might not have won if I hadn't had the friends above with me. Sydni Stinnett, my 14-year-old vocalist phenomenon, sang my two pop songs better live than on the recording, and I was able to rely on Steve Rutledge's guitar while limping along on my own. And dear friend Margaret added her usual rich and creamy background vocals as well as her treasured friendship and moral support. Friends! I have some! And singing friends are some of the best. I also had some friends from Chicago, now transplanted to Chattanooga, come up to see and support us, and that made things better. Like an idiot I took no pictures of them but love you S & V.
What can I say? I am competitive. I won the grand prize, took another first prize in lyrics, took two second prizes, and it was a bucket list moment, a dream come true. I know that Nashville doesn't give a hoot about contest wins, and I know that many contest winning songs aren't the ones that end up on the radio. But I'm still thrilled. I'm also inspired by what I learned from hearing other songs, from workshops, from seeing what did well and what didn't in the eyes of the 5 music industry people I met and had some good conversations with. I'm learning, more and more, that it's the people that matter in these experiences, and I was so grateful that Steve and Syd would travel to Gatlinburg just to help me out, and that they got to be part of my win, as they should be. My favorite moment was Margaret, crying when we found out I won; Margaret who has sung my songs with me for more than 20 years, saying "it's been a long time coming." It doesn't feel like a long time, it feels like a great time that's just getting better.